The Dragonfly was Yo-Yo Jam's very early butterfly model. It featured a ball bearing axle, adjustable string gap, light-weight plastic body in jet black, and diffraction foil logo on a clear disk. 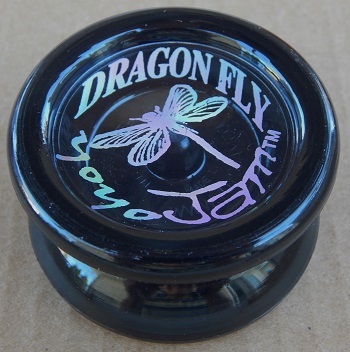 At the time this yo-yo was released, the name "Dragonfly" was in violation of a pending trademark name filed by Playmaxx in 1998 and officially registered in 2000. As a result, the name of this yo-yo was soon changed to "DragonJam". Today, Duncan is the owner of the "Dragon Fly" [sic] trademark name. The Dragonfly trademark actually extends back to late 1971 when Union Wadding of Pawtucket Rhode Island, under the brand name Festival Yo-Yos, released a Dragonfly yo-yo with the "TM" after the name. Union Wadding, however, let the trademark expire after 20 years (late 1991). Playmaxx began using the trademark in the late 1980s, early 1990s, but didn't registered the name until 2000. Yo-Yo Jam officially closed its doors and went out of business Wednesday, December 30, 2015.